Frantic and riff-laden Black Metal from Austria. Haunting melodies in the 90s vein merged with psychedelic, dissonant parts and intricate song structures. Three tracks/23 minutes; available on tape (pro-manufactured, first edition of 50 copies) and digitally through Bandcamp. "Showing more promise in their first three tracks than many established acts can manage across several releases, ‘Wine, Song and Sacrifice’ imbues their raw-ish black assault with equal doses dissonant horror, Dionysian madness, vampiric melodrama and rhythmic tribal intoxication. 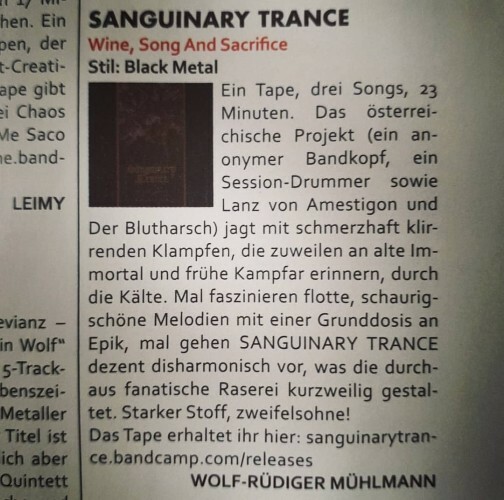 The overall effect is a menacing and overwhelmingly sensual high that can be quite dizzying if it hits you just right [...]"
"‘Wine, Song and Sacrifice’ is a bloodstained love letter to the most iconic of black metal times, but with an unmistakably unique viewpoint on it. 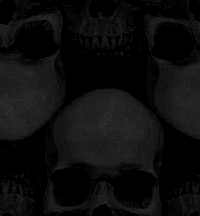 With some unforgettable moments that set your teeth on edge and make your hair stand on end, Sanguinary Trance are indeed trance invoking and the feelings it conjures are black magickal." "Highly expansive and meditative stuff. Thumbs up." Gefällt mir gut. da kann man bei Bandcamp mal einen Taler dalassen. "Es ist gut zu sehen (und zu hören), dass die österreichische Szene nach wie vor so vital ist und man sich nicht auf die Großen und Etablierten im Genre zu beschränken hat. Und trotz des viel zu leisen Sounds (den ich in der Wertung mal nicht berücksichtige, da Mix und Mastering ansonsten gut gelungen sind) liegt hier eine EP vor, die sich vor deren Alben in keinster Weise zu verstecken braucht, sondern manchem Altmeister deutlich zeigt, worauf es heute ankommt: Passion und Eigenständigkeit sind hier die Schlagwörter, die sich SANGUINARY TRANCE ohne Zweifel auf die Fahnen geschrieben haben. Ich für meinen Teil bin sehr zuversichtlich, dass man in Zukunft weiterhin mit diesem Projekt rechnen sollte. KAUFEMPFEHLUNG! +++ 8 / 10 Punkten"
"The unique highlight of "Wine, Song and Sacrifice" is the opening title track. It is a thirteen-minute atmospheric piece with a few exclusive moments. If I had to compare it to someone, I would not be afraid to point out to compatriots Abigor in their golden era. The second track "Carvings" represents the more aggressive but still traditionalist face of Sanguinary Trance. Specially conceived is the final "The Dionysos Whip", which preserves the sound of the nineties, but with the disharmony and the gauntness typical of the much later development stages of the genre. However, as in the title track, the song improves impressively to make a one-second noose at the very end." "Wine, Song and Sacrifice is truly an EP to behold. Through three offerings it is incredibly varied and unique, each track bringing something different to the gnarled and chewed up blackened table. With ripping riffs, a greatly varied vocal delivery, machine gun drumming and an overall raw and powerful production, Wine, Song and Sacrifice is an excellent EP. This is an unmistakably superb and a very well rounded debut offering." "If they had not told me that this was from 2018, I could easily guess that it is old material. And every time I hear it I can not stop thinking about Hirilorn, Sacrilegium or even the first Satyricon material; [...] A unique experience; an unparalleled journey of chaos and madness perfectly made through these three tracks that together tell a story of evil and secrecy. 6 stars of 6: A Masterpiece."